Fluffy chocolate cupcakes lightened up to save on calories but still taste amazing. Topped with low-fat chocolate icing, no one ever guesses they’re healthy! A few weeks ago I sent an email over to America’s Test Kitchen to see if we could work on a project together. I was so excited when I got a very positive yes back from them. They wanted to know if I could help promote their Comfort Food Makeovers cookbook. They got a very excited yes in reply! Comfort Food Makeovers is such a clever book that takes your and my favorite classics and popular restaurant dishes and gives them a makeover for the better. The goal was to drop fat and calories without sacrificing flavor, and if anyone could pull this off successfully it would be America’s Test Kitchen. The best part is they aren’t subbing in things like artificial sweeteners in the dessert, or on the other end of spectrum, there’s no cauliflower hiding in the mac-n-cheese. They use everyday classic ingredients but cook smarter. I love their approach to cooking! If you are an old-timer to the blog you know that I’m an America’s Test Kitchen lover (fondly known as ATK to their fans). Husband got me three of their cookbooks a few years ago for Mother’s Day and I blog the recipes often. What I love is that they take the time to teach what they are doing and why they are doing it. They include way more than just a recipe and pictures; reading their cookbooks is like a mini cooking class which I love. So when presented with an opportunity to work with a new cookbook of theirs I jumped at the chance. Comfort Food Makeovers doesn’t even come out until this Friday (March 1), so ATK sent me over to look at the recipe index for the book. Once I got through all of the delicious pictures and description of the book I stared in wonder at all it includes. Mozzerella sticks, Pork Lo Mein (compared to P.F. Chang’s), baked ziti, cheesy garlic bread, chicken marsala, and potato salad. Then comes cinnamon rolls, carrot cake, lightened up chocolate cupcakes, and key lime bars… can carrot cake really be lightened up?! They let me pick out 6 recipes from the huge list and then they emailed the recipes over to me (the book isn’t out yet remember). So I just got a taste of what’s to come and boy oh boy am I hungry for the rest. America’s Test Kitchen also agreed to giveaway a copy of the book today! You can enter using the Rafflecopter tool below, and if you don’t want to wait to see if you are the winner you can always preorder your copy of the book here. I was really excited to get the recipes and to see the approach that ATK was using to achieve a lighter version of such classic dishes. We’ve all heard of replacing applesauce for oil or even ground black beans in brownies, so how would they reduce the calories in cupcakes?! Well friends, I’m pleased to announce that they just swapped canola oil for butter and went from there… nothing too crazy and the results were phenomenal. 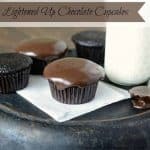 I make a lot of cake and cupcakes and these lightened up chocolate cupcakes were probably the best I’ve ever made. I’m not buttering you up for the book; I’m telling you so you make them! The texture was perfect, which is normally my complaint when it comes to homemade cupcakes/reduced fat desserts and the flavor was very rich. Thomas was out of town when I made them, so I saved him some as a little test (he LOVES cake). I just had him eat a few when he got back and asked him what he thought. He said they were excellent but he would call them dark chocolate cupcakes, not just chocolate (hence the richness and color). I explained that they were lower fat than normal and he was sincerely surprised but totally happy with the results. Not too shabby if you ask me. And my icing was a bit thinner than intended, so I was only able to get about 1 tablespoon on each cupcake which means even less calories. The thin icing was still delicious and the cupcakes tasted a lot like my grandma’s sheet cake which is a good thing. The original recipe calls for 3/4 teaspoon instant espresso powder to be added with the chocolate and cocoa. Leaving it out was the only thing I changed. To properly measure boiling water allow a larger amount of water than you need to come to a boil in a small saucepan and then carefully measure out the amount of water needed once it has begun to boil. I used dutch-processed cocoa with wonderful results, and would recommend it (something like Hershey’s Special Dark). You could use traditional cocoa but your cupcakes and icing will look less black and more brown than mine. Don’t be tempted to switch all-purpose flour for the bread flour. The extra gluten in bread flour is a big part in the texture and structure of the cupcakes. Preheat the oven to 350 degrees and line a 12-cup muffin tin with cupcake liners. In a large bowl add the chocolate and cocoa. Pour the boiling water over the top and allow the mixture to sit for a few minutes to give the chocolate time to melt. Whisk until smooth and then let the mixture cool, about 10 minutes. In a small bowl combine the flour, sugar, salt, and baking soda. Whisk to combine. Once the chocolate mixture has cooled add the eggs, vinegar, and oil to the bowl and whisk until smooth. Add the flour mixture and whisk everything together until well combined and a smooth batter is formed. Measure out 1/4 cup of batter into each muffin tin. Bake the cupcakes for 17-19 minutes until a toothpick inserted into the center comes out with just a few moist crumbs attached. Pull the done cupcakes from the oven and place the pan on a wire rack. Let the cupcakes cool in the pan, on the rack, for 10 minutes. Remove the cupcakes from the pan once the 10 minutes are up and allow them to cool completely on the wire rack, about 1 hour. 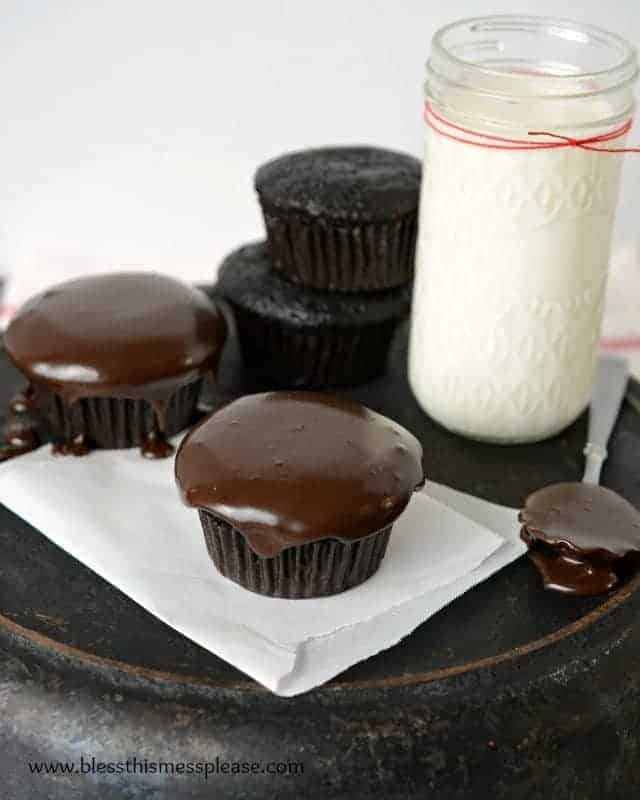 Frost each cooled cupcake with about 2 1/2 tablespoons of the chocolate frosting and serve. 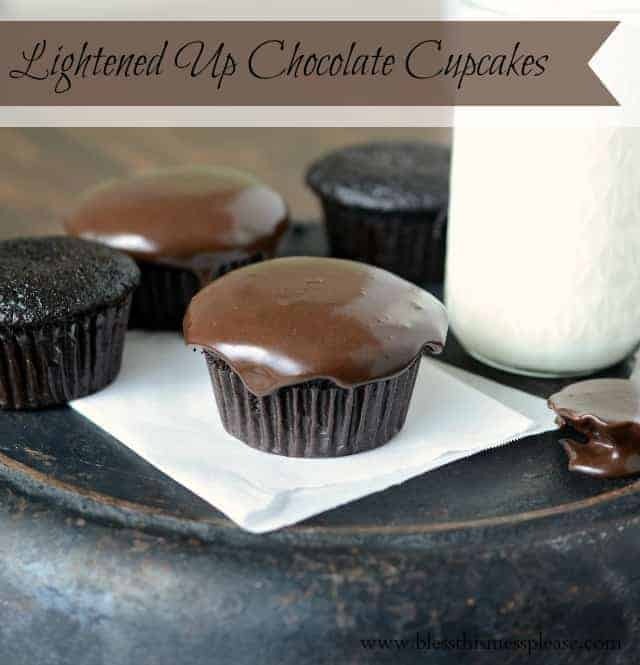 A low-fat, easy chocolate icing recipe perfect for cupcakes and cakes. Combine the powdered sugar and cocoa together in the food processor and pulse a few times to combine. Add the milk, butter, melted chocolate, and vanilla, and pocess untill smooth. I used dutch processed cocoa powder and would recommend it. You can use traditional but your icing won’t be as dark as mine. Give these chocolate cupcakes a try, you won’t regret it! I believe that Comfort Foods, along with soups and stews, are the heart of cooking and eating. They’re the soft foods that we ate when we were so young that we didn’t have much in the way of teeth, so we love the texture, and any book by Cook’s Illustrated is a please to read and cook from, so I’m looking forward to it. I would love this cookbook because recipes by ATK are guaranteed to work! You are so right Suzanne! I’m a recipe tweeker and I never mess with thiers. They are always perfect. My mouth is watering just thinking about these and all the other delicious recipes! Those cupcakes look like they should be 2,000 calories! I cannot wait to make them! I’m a huge fan of ATK as well! They honestly do make you feel like you’re learning something new every time you cook, and it’s always delicious. I can’t wait to try these cupcakes and I can’t wait to see their Mac and Cheese recipe! This sounds great, hope I win! I love ATK and would love to get my hands on this cookbook! Oh my goodness, Melissa! These are fabulous! I adore ATK…made one of their recipes yesterday! PS: gorgeous photos!!! A while back I made this mistake of adding only half the butter to my cookie recipe and they turned out amazing. Since then I have been wondering how many other things can I make with less fat and calories and still have a great taste…I am so excited for this cook book! Hey fancy pants, way to go! Yummy! I’m always looking for healthier alternatives to the comfort food my family and I love. They Look amazing! I love ATK ! These look fabulous. I love ATK! Thanks for the recipe and the giveaway. Awesome! What a great pairing. I love watching their show on PBS. My oldest daughter loves to cook and listens to their details in earnest :). And way to go for contacting them! LOVE LOVE LOVE my ATK cookbooks & can’t wait to see this one!! Thanks for testing! 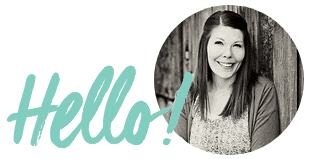 I have loved the give-a-ways not only for the chance to win something but because i have found some great blogs!! Thanks!! The ATF!! And the cupcakes look amazing! Needed an idea for a dessert and just found it! Thank you! Can I just say those look so yummy! Need to go get a few ingredients, but then I am definitely trying them! I would love to win this cookbook. I am a big fan of their slow cooker and baking cookbooks so I know this one will be great! Hershey’s Special Dark is not 100% Dutch processed, however. For consistent results, I use 100% dutch processed cocoa. Bread flour? Who would think up that? Only ATK! That is awesome! I know it’s not all Dutch processed but I can’t get anything better here in the middle of no where and it’s a reasonable price while still being better than traditional cocoa. I wonder how much of it IS Dutch-processed though?! Do you know? And ATK didn’t recommend the Dutch-processed in the recipe… just cocoa. I used what I had and liked, with good results. I have recently found dutch processed at a few places….one is an amish store near my house here in Indiana and a food storage company from Utah (shelf pantry or something like that). But the other place I usually get it from is Penzey’s Spice- they have amazing spices for reasonable prices. There’s not one in Utah, but there’s one in Louisville (maybe your mom could pick it up next time she’s at the temple), but they also have free shipping on orders over $30. I just looked and a pound of dutch processed cocoa is $11.30. I love their cinnamon, cumin, nutmeg, curry powders (used it when I made your curried coconut chicken with squash and dried cherries and made it amazing), and everything else I’ve tried. So much better than spices bought at Walmart and pretty comparable prices. I love sweet things so I use their sweet curry powder, but I also like their garam masala. I haven’t tried the others yet, but plan to in the future. I have just recently discovered ATK (I know, I know) and I would LOVE this cookbook! Thanks for the chance to win! Thanks. I love ATK recipes! I love ATK! This cookbook looks fantastic! I have 3 of their cookbooks already. I love your blog and I love ATK!!! These look great and I’d love to win an ATK cookbook I don’t already own. I’m curious why you left the esspresso powder out? Was it because you just didn’t have any or for some other reason? I’m Mormon! We have a bit of a health code we like to stick by (no alcohol, no smoking, moderation in all things…) and coffee happens to be on that list of things to avoid. I assume for it’s addicting qualities. I know a little espresso powder never killed anyone, but I have always liked to do things with my whole heart, religious convictions included. Is that crazy?! Thanks for asking. New cookbooks are always exciting and I hear lots of wonderful things about these! Wow, I’m totally making them!!! They look sooo good!! I’m addicted to ATK, and I truly appreciate everyone there for doing what they do. Thanks for the opportunity to win the cookbook. ATK has some of my favorite recipes. Making comfort foods more healthy is a smart thing to do. These look Sooooo yummy! Dark, delicious, and decadent! Will definitely make these. Thanks for the recipe! Love ATK!! just recently bought my first book of theirs, love how well tested all recipes are!! would love to win this book! I would LOVE to win this cookbook! I didn’t see a place to add my email or share the post on fb? I love ATK cookbooks and their show on PBS! Yay Melissa! This is so exciting! Hmmm. I would use all-purpose white flour before whole wheat… whole wheat is pretty hard to work with when it comes to cakes. Are you able to buy gluten in a tub in the baking isle? Or does the internet tell you any good subs for bread flour?! Let me know!! yum! these do not look lightened up so I love it!!! I’d love to get my hands on this cookbook! I am currently crossing my fingers that I win! Ya ATK!!!! I am so excited about their new cookbook! I love ATk! You are so fun! This cookbook looks fantastic. I am a new follower of this blog and I am really excited about the giveaways! I wouldn’t have know it by just the first name but OF COURSE I REMEMBER YOU!!! Sarah loved you and so did Macey and I 🙂 How the heck are you!? Looking forward to trying that Cupcake recipe! I would love to win the cookbook. Thanks. I love your blog name! 🙂 And I adore the America’s Test Kitchen, so thanks for the giveaway! Sounds like a version of Devil’s Food cupcakes, except better with actual chocolate and not just cocoa :). Thanks for sharing this recipe. I have it marked to try. Those cupcakes look so chocolaty I can almost taste them! i love their show and i love your blog. you are so honest and adorable!!!! I have never wanted a chocolate cupcake so badly! I love America’s Test Kitchen! Woo woo woo woo woo! These cupcakes are seriously making my mouth water. Between the deep color and the drip on that frosting. Awesome photos. I frequently replace butter with olive oil in cakes and muffins and love it. So, I imagine these taste just as good as they look. Have a great day! Cannot wait to try this recipe for my husband’s birthday party next month! i love ATK too. their recipes are classic and they work! I would love to win, because I’ve never failed when following a ATK recipe – made their roasted shrimp last week and it was so easy and soooooo tasty! I am a huge ATK Fan!!!! I would love to get this book! Thanks for the recipe! I’ve been on a great health kick and am constantly looking for ways to satisfy my horrible sweet tooth while still staying healthy. I love ATK! 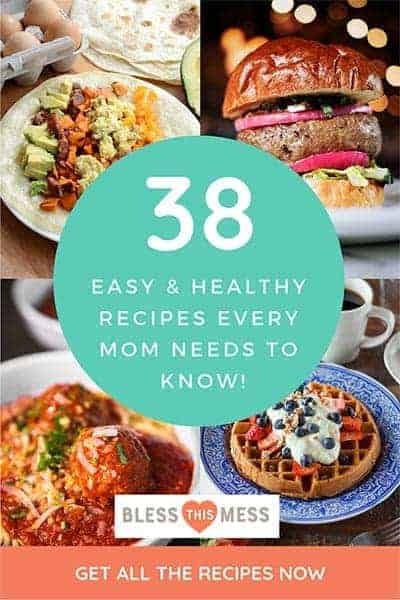 Their recipes and explanations are awesome, and they always work! I never would have guessed these were lightened up. They look decadent. This sounds like the perfect cookbook! Still able to eat the classics but know that I’m eating a healthier version is ALWAYS the best! These really look lovely and so moist! Yum! This is any awesome giveaway! Thanks so much, and i cant wait to try those chocolate cupcakes!! It would help our family eat better! I am really excited about this giveaway. I have never used the ATK cookbook. I am always looking for good recipes that are easy to follow and always turn out. Thanks Melissa for getting this together. I am excited to try the cupcakes. Great post. I love all things ATK and even have a couple of my cookbooks signed by Christopher Kimball…got to meet him at a local bookstore and I was literally star struck 🙂 I’ll be buying this book if I don’t win. Ummm…YES! This cookbook would be amazing! I haven’t heard of America Test Kitchen before. It sounds good. Ooh, the cupcakes look divine. We like you, a lot!! This would be perfect for me right now!! We are really trying to eat healthier but sometimes you just want some good comfort food! Yay for the giveaway! The icing on these cupcakes is out of this world! These are super quick and delicious! I used regular all purpose flour, and used half a cup of batter to fill “jumbo” tins (made six) for a dinner get together. Made a buttercream frosting to top them off so they were a lot higher in fat and calories! 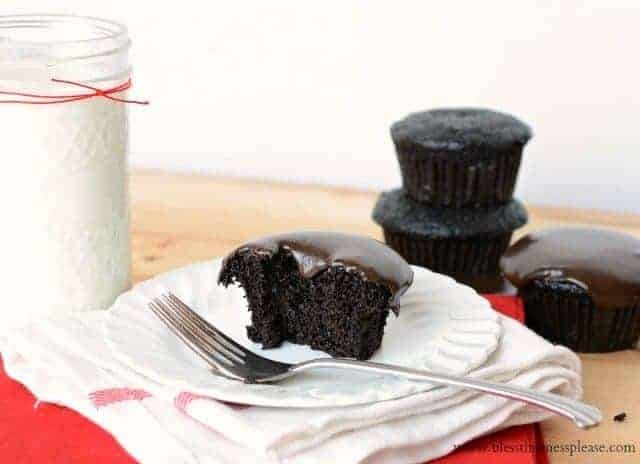 These were so quick and simple to make, and were such a decadent, dark and moist cupcake. Very impressed. Can’t go wrong with ATK!